Whether your family wakes up to a frenzy of wrapping paper or sits down for breakfast before diving into the festivities, Christmas morning calls for something special (like a red and green casserole). Try some of these seasonal and exciting dishes that will get the day off to a scrumptious start. All of these can be made to serve a crowd, but you can scale down the recipes for a smaller gathering. 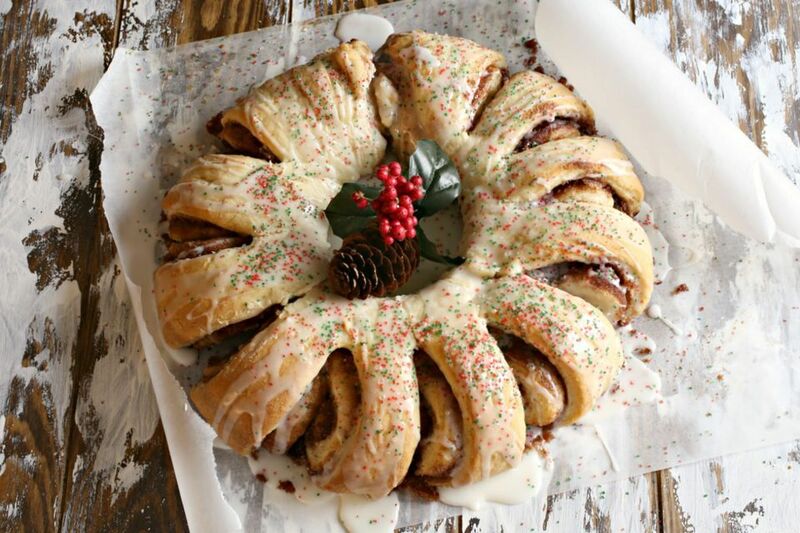 This cinnamon roll wreath is as beautiful as it is festive, and the smell of the spiced dough will definitely get everyone out of bed in the morning. It does take some assembly, so make it ahead of time, then just pop it in the oven when you get up for a stunning breakfast that will bring the whole family running to the table. These easy pecan sticky buns are perfect for starting off your Christmas Day on the sweet side. Because they're made in the slow cooker, you can start them before you open gifts and then dig in when everyone's enjoying their haul later. They also freeze well, if you find yourself with leftovers. Most breakfast casseroles use eggs and sausage or bacon as their base, but you can easily make them meatless. This one calls for meat substitutes, but feel free to swap in tofu, seitan, beans, or legumes for a hit of protein that will carry you all the way through Christmas dinner. The recipe makes enough to serve a crowd, and you can assemble it the night before to simplify your morning. Italian families may already know the wonders of panettone, a buttery, raisin-studded Christmas cake. While it's excellent on its own as either a breakfast bread or dessert, it also makes a delightful French toast bake. Make it on Christmas Eve before setting out Santa's milk and cookies and toss it in the oven in the morning. The texture gets creamier as it sits out, so if you like a firmer French toast, make it in the morning and bake right away. What's more Christmas-y than gingerbread French toast? This baked version doesn't require slaving over the stove and will be a sweet way to get Christmas going. French bread works well, but you can use any other type you have on hand. Refrigerating the casserole overnight gives it a lovely texture, but you can let it sit for just a few hours for a firmer French toast. Serve it with powdered sugar, maple syrup, or even vanilla ice cream for an extra decadent start to the day. Using canned refrigerator dough, these bacon, egg, and cheese croissants couldn't be easier. It's also easy to scale up to make a big batch. These are great for a handheld breakfast while opening gifts, on the way to grandma's house, or just a lighter starter to a long day of making merry. Not a bacon eater? Stuff them with sausage or ham instead. These easy, open-faced smoked salmon bagels will feed a crowd, New York-style. Set out a variety of bagel flavors, cream cheese, smoked salmon, and toppings on a self-serve bagel bar for a do-it-yourself breakfast buffet. Most delis sell pre-packaged smoked salmon, but you can make your own, too. If some family members aren't fish fans, they can leave it off and enjoy the bagels and cream cheese on their own. What’s better than the scent of fresh-baked bread to greet your guests on Christmas morning? Whip up these tempting biscuits ahead of time and pop them in the oven before everyone wakes up. Make sure you cook and cool the sausage fully before adding it to the batter, otherwise it will melt the butter and cause the biscuits to come out less flaky. Add chopped chives, scallions, or other cheeses to mix up the flavor. 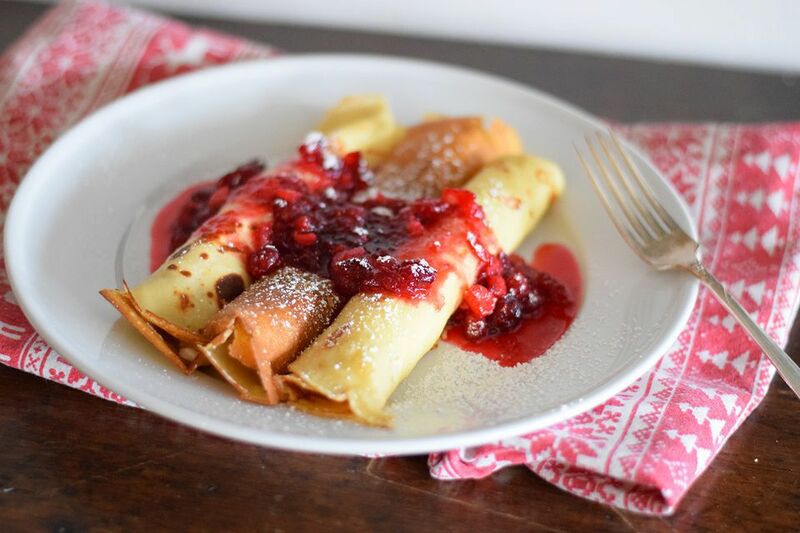 These merry Christmas crepes use tart cranberries, rich cream cheese, and candied ginger for a truly holiday-worthy flavor. Don’t be scared off by crepe-making—they’re really quite simple once you get the hang of it. Best of all, you can make the crepes ahead of time and freeze them until you’re ready to eat. Just allow them to come to room temperature, then warm in a 200-degree oven before assembling. Breakfast casseroles make a simple Christmas morning meal because it doesn't require standing over the stove. This simple recipe uses refrigerated rolls for a simple assembly, but you can make your own as well. Use any type of cheese and adjust the seasonings to suit your family's tastes. This hearty hash brown, egg, and ham casserole bakes up in the slow cooker overnight so it’s all ready for you to eat on Christmas morning. Chopped bell peppers and chilis give it a nice zip, and you can adjust the spice level by adding spicier peppers or omitting them entirely. You can also mix up the flavor by using sausage or bacon instead of ham. Use partially thawed hash browns to extend the cooking time even further, but make sure they’re thawed enough to break into shreds and distribute evenly throughout. The combination of peppermint and chocolate tastes like Christmas, but you don’t have to limit it to your mug. Make a stack of these decadent pancakes for a truly special Christmas morning. Top them with extra chocolate sauce, miniature marshmallows, crushed peppermint candies, or even vanilla ice cream for a really special presentation. After all, it’s the holidays. Breakfast burritos make a delicious, hearty way to start the day, but they can be labor-intensive if you’ve got a lot of mouths to feed. This freezer recipe is great for Christmas morning because you can make them whenever you have time, then just reheat in the microwave or the oven when ready to eat. Feel free to customize the flavor profile by using bacon, sausage, regular ham, or other cheeses. This gorgeous breakfast braid will be the crown jewel of your Christmas breakfast table. Because it feeds a crowd, it’s perfect for a holiday meal. You can use either frozen puff pastry or make your own if you’re feeling ambitious. Top it with sliced almonds for crunch, or a little streusel if you want a slightly sweeter bread. Nobody will be able to limit themselves to just one slice. If you just need a light grab-and-go breakfast or want to add a little sweetness to your brunch buffet, these maple-glazed gingerbread muffins will be just the ticket. And what’s more Christmas-worthy than gingerbread? They’re best eaten the same day, but can also be stored in an airtight container for a couple of days. Make sure to wait until they’re totally cool to glaze, or else it will be too runny and make a mess of your kitchen.